EngagingPatients.org Real-Time, Intentional Patient and Family Check-Ins: A Catalyst for Cultural Change - Welcome to EngagingPatients.org! As the mother of a son who was a long-time patient here at Children’s Hospital of Philadelphia (CHOP), I understand what it is like to experience many aspects of our vast healthcare network. Today, my son is healthy and has successfully transitioned to adult care and I am enjoying my “dream come true” job of helping CHOP with work that is designed to deliver the best experience possible for all of our patients and families. When our Sr. Director of Patient & Family Services, Rachel Biblow, encouraged me to merge my consumer financial services background with my experience as the parent of a patient to take on a role managing our Patient and Family Experience Team, I viewed it as an opportunity to help others as I had been helped. One of the first things we focused on together was connecting with more families at the point of care, We wanted to know what was going well and not so well in “real-time” instead of relying solely on survey data returned by families weeks or months after their experience. Rachel encouraged the team to align with our nursing and family leaders on the work. The result is Real-Time Intentional Patient and Family Check-Ins. CHOP is passionate that bedside check-ins not be something to just “check off the task list,” but that they be true connections and conversations with families. We are early in our transformational journey here at CHOP, but test results have shown increased staff engagement and early gains in patient/family satisfaction scores. As I will discuss here, the critical factor in our early successes has been the strong partnerships between teams of nursing and family leaders in getting more actionable patient and family feedback in “real-time”… and the fact that we consistently put patients and families at the very center of this work. The first thing we did was to engage our strongest nursing leaders and to partner them with our family leaders. The teams created a semi-structured conversation comprised of simple questions related to the care dimensions that we know are important to patients and families. We were passionate that the check-ins not be something to just “check off the task list” or simple bedside surveying, but a true connection and conversation with families to make sure they know that we are listening and committed to taking action to make sure everything is going as well as possible. Using improvement methodology and relying heavily on the voices of patients and families, Nurse Managers, Patient/Family Experience Specialists, Family Consultants and members of the Family Advisory Council collaborated on a pilot to standardize nurse leader “intentional check-ins” starting on two units. Initially our focus was real-time connections with families for faster data and learning.. Early in the test however, we realized that we were also creating an important culture change at the same time. Some nurses told us anecdotally that prior to this process, they sometimes avoided patients and families who were unhappy or part of a challenging situation…hoping for an early discharge rather than engage! Within just a few weeks, nurses on the test units reported that they felt much more confident to jump in and connect with a family if things were not going as well as they should be. They really began to believe in the process, which lead to greater staff satisfaction and confidence. And, when things were going well, staff reported being excited to share out in the daily huddle so that best practices could be shared. When things weren’t going as well, we were able to repair and restore the connection while the family was still with us…which makes everyone happy! 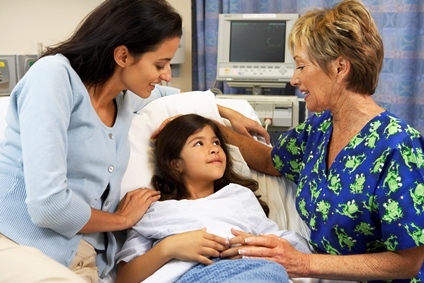 Nursing leaders have reported that their teams feel they are proactively driving an ideal “total” patient experience at the bedside from admission to discharge and beyond which has begun to directionally impact the organizational metrics on patient experience. Small improvements have been seen in satisfaction scores related to communication. Secondarily, data yielded positive comments about staff providing opportunities for public recognition and increased staff satisfaction as evidenced in staff satisfaction data 7 months and 19 months after testing began. The outcome of our work has been measurable. We’ve seen increased staff engagement and satisfaction, proactive problem solving, stronger teamwork, service recovery, increased communications between nursing and rest of the clinical team, improved learning and sharing out of best practices, and positive feedback from patients and families. The check-in conversations yield meaningful, actionable feedback at the point of care and are conducted by nursing leaders. Our next steps include testing Real-Time Intentional Check-ins led by leaders in other disciplines to partner with nursing and enable us to complete more conversations in both inpatient and ambulatory points of care. Editor’s Note: CHOP’s real-time,intentional patient and family check-ins program was a finalist in competition for the John Q. Sherman Award for Excellence in Patient Engagement. You can find further details in their award submission. A long-time champion for Patient and Family-Centered Health Care, Kathryn Conaboy is currently Patient and Family Experience Manager for The Children's Hospital of Philadelphia. She combines more than 20 years of senior level experience in consumer marketing, communications, research and customer service with her decades-long journey as mother and advocate for a complex pediatric patient to create successful communication and behavior strategies that improve the patient and family experience. She has presented at several International Conferences for the Institute for Patient and Family Centered Care and recently co-authored an article about CHOP's Family Partners Program that was published in the Patient Experience Journal.